Here are the last in my sets of tags to give away this year. I think these cuties are my favorite! The tag is again from Cricut Classic Font cut at 3 3/4" with a shadow. 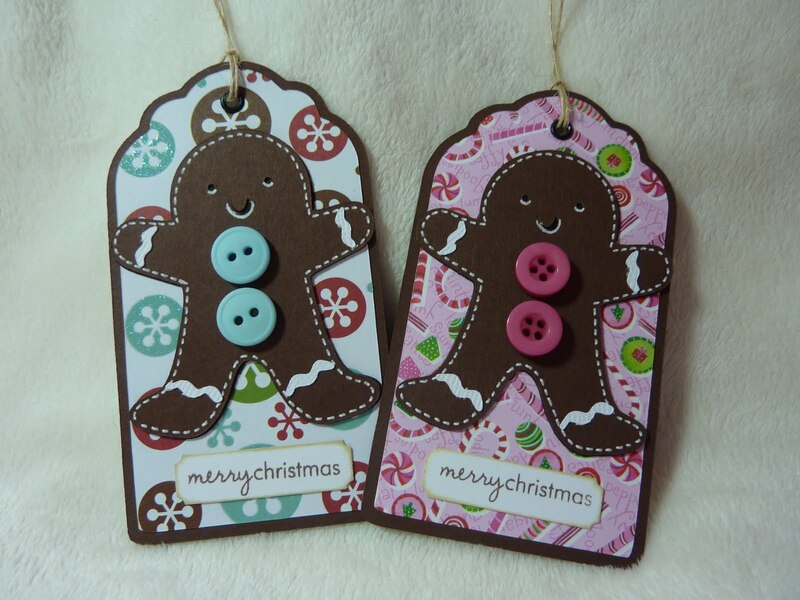 The little gingerbread people are cut at 2 1/2" from Jolly Holidays. I didn't cut out the button layer, substituting real buttons instead. katie~ I haven't been looking at anyone's blog in a week...I've sure missed alot! All of your tags are so cute! You even made the guy on the unicycle cute (not my favorite cut)! ps. you are also making me the imagine, which I'm trying not too! They look so sweet and yummy! These are absolutely adorable! love it, makes me wish we were actually doing Christmas this year..
Christmas Tag #4 and a Winner! Your Story Photo Blog Hop!